These three books will make a great addition to the library I keep for my grandchildren. 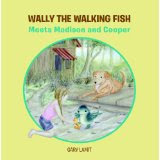 This is the story of Madison, a young girl and her dog Cooper. As they are fishing one day a fish comes walking down the pier. He is a walking cat fish. Madison introduces the catfish to some of her friends while she learns more about him. This was a cute book with really cute pictures. What I liked most was the educational aspect. Throughout the book there are small informational boxes that give the reader additional information. The personality of the animals is wonderful. I loved cooper and the way you see him roll over and laugh and make fun of what the catfish says. Great read. My grandchildren will want this one read over and over again. Cookie, whose real name is Catherine Isabella Marie Jenkins likes cookies. She won’t eat anything but cookies. She eats them for breakfast, lunch, dinner, and dessert. Her parents try to get her to eat food by disguising it, but she refuses. Something happens to her to change her mind and make her decide cookies should be saved for dessert. I loved this book. The pictures were simple, the message was simple and not preachy. Any kid who reads this or has the book read to them will understand the message about eating a healthy and balanced diet. This is a book that parents will enjoy reading to their children.